Iowa’s first woman Supreme Court Justice, Linda K. Neuman, left, catches up with longtime friend and former Iowa Lt. Gov. Joy Corning, right, in this October 2016 photo. Former Iowa Gov. Bob Ray, right, and former Lt. Gov. Joy Corning look on during inauguration ceremonies for Iowa Gov. Terry Branstad on Jan. 14, 2011, in Des Moines. 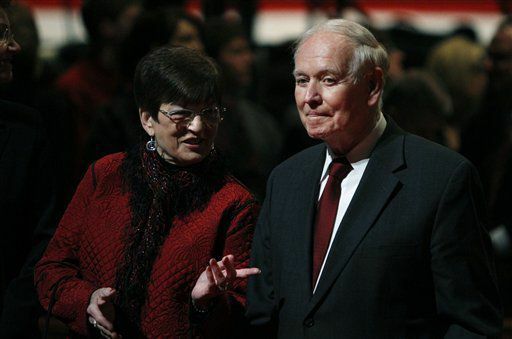 CEDAR FALLS — Joy Corning, a former lieutenant governor, Republican state senator and Cedar Falls School Board president, died Saturday at the age of 84 with her three daughters by her side. As ever, the public servant was prepared and did things on her own terms. That included writing her own obituary. “Thanks to all who have contributed to and enriched my life,” the obituary concluded after writing about not her many accomplishments but her family and her passions. The full obituary is online at http://www.ilesfuneralhomes.com. The visitation will be from 4 to 7 p.m. Wednesday at Plymouth Congregational Church, 4126 Ingersoll Ave., in Des Moines. Memorial services will follow at 11 a.m. Thursday at the same location. Corning’s daughters added her accomplishments in an addenda to Corning’s own words. She also served as a state senator from Waterloo-Cedar Falls, as well as being on many boards and foundations, including involvement in the University of Northern Iowa, her alma mater. They said she was active until the “very end” on efforts that supported human rights and justice. She experienced a resurgence of a liver condition that meant her liver was failing, the family explained in a piece in the Des Moines Register about Corning preparing for the end of her life, which she was planning “without fear, anger or bitterness,” according to the article. Daughter Ann Lyons, of Cedar Falls, confirmed on Sunday that attitude continued until her mother passed away. Pat Geadelmann, who retired from UNI last year as special assistant to the president for board and government relations, got to know Corning in her many capacities in the community during those years. Geadelmann said Corning also was selfless and dedicated to women’s rights, human rights, her family, and did it all with a great sense of humor. Iowa Sen. Jeff Danielson, D-Waterloo, who represents the district similar to the one Corning represented about 30 years earlier, got to know Corning particularly well in the past few years. Though they sat on opposite sides of the aisle, he serves as a Democratic co-chair for No Labels in Iowa and she had served as a Republican co-chair for the organization dedicated to getting past partisan division in politics. He recalled being snowed in, in New York City in 2015 after an event for No Labels, and how that gave them a chance to talk more about their political beliefs and how to walk the path in the middle-ground, rather than at the extremes of politics. He said that was evident even in her final interviews that she was full of peace, strength and confidence. Corning graduated from Bridgewater High School in 1949, and later from the Iowa State Teachers College, which became UNI. She was married to Burt Corning — “the smartest thing I did in my life” — and they had three daughters. Her husband preceded her in death. She has nine grandchildren and two stepgrandchildren.